Flynn returns with a plan to get the main Library back using various artefacts the team has obtained in previous missions. They begin by using the storybook to try to bring to life a story in which they can get the door back. Unfortunately, Dulaque arrives to completely flip their plan on its head. He uses the door to go back and access the "Loom of Fate," and try to reverse the historical fall of Camelot. Flynn and Eve had followed him but were unable to stop him in time. Eve is thrown into various realities where Jake, Ezekiel, and Cassandra became the Librarian instead of Flynn. First she encounters Librarian-Jake who had been involved with Eve, who had died in this universe and in turn had been involved with Jake (so he greets his not-dead Guardian with a kiss). Librarian-Jake had been unsuccessful in trying to keep the evils of magic contained, so he tries to send Eve and Flynn back to the correct universe but instead they meet Librarian-Ezekiel. Eve had also died in this universe, while Flynn is just amazed that they were transported because he had never become a Librarian. In this universe, the encounter with the house that granted wishes went wrong when Ezekiel tried to take the killer down. Now the outside world is full of ghosts. The team bands together and is able to de-ghost everyone but afterwards, Eve and Flynn find themselves transported to the next version of reality. Here in this universe, Cassandra is a powerful sorceress. Eve had also died in this universe. The reason why they're jumping universes is because Dulaque cut the thread without re-weaving it so now they're jumping from thread to thread. History will continue to unravel until all is undone. Together, they formulate a plan to re-weave the threads together, using Cassandra's magic to help them combine their abilities and re-access the Loom. All of the Librarians are pulled into one universe and they join hands. Eve and Flynn are transported back to the Loom where they meet a young and restored Dlaque/Lancelot who attacks them with a sword. He stabs Eve in the chest and then Flynn tried to fight him with a sword. It's then that Jenkins/Galahad shows up, sword in hand, to hold Dulaque off while Flynn restrings the Loom with thread from the Labyrinth. The three of them return to their original reality and are able to access the Library. Flynn is elated to be back where he belongs while the potentials are holding a dying Eve. Flynn accesses a healing tonic which he uses to save Eve. Each of the young Librarians are given their own versions of the clipping book, though they decide to team up for their first independent mission. Flynn asks Eve out on their first date, on which they take the magic door to embark on an adventure. 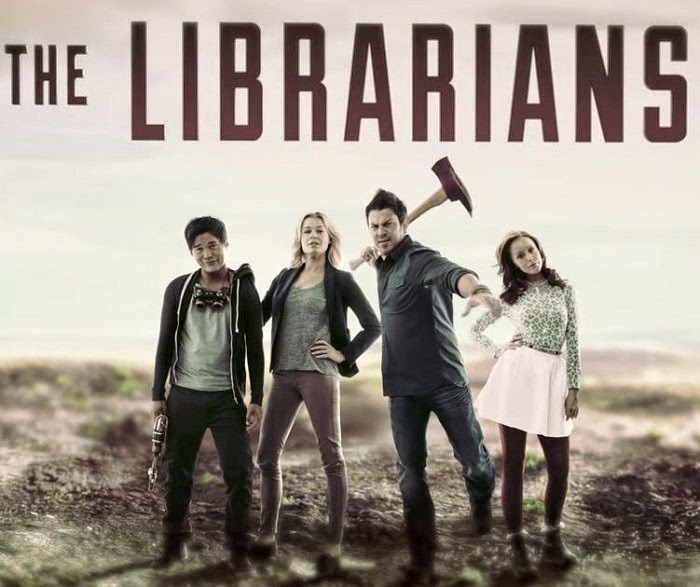 Such a great fun show.. Christian Kane gets to ROCK out his #STONE character in episode 9 of The Librarians.. he he ♥ Hope this show has a long run! Love this show. The twists in each episode made if so much fun to watch. We definitely need a second season.